In November by my own standards I was really quite ill, but quite frankly the silver lining for me is that by having a seizure, I realise how lucky I am to have so few. They gave me a glimpse into the life I could have had, had it not been for the surgery which altered the direction that I would travel in the future. The brain surgery I had, now half my life ago. Not since that surgery when I was 14, have I had two seizures in one week. But last month I did. I comprehensively chewed my lip, the side of my mouth and my tongue on those two separate occasions in a very short space of time, feeling weak as a result and my recovery not being helped by it being incredibly painful to eat food. Even a cup of tea was too painful to drink. But then I have to think, what if it was like it was before and I felt like this at lease once a month? What if I wasn't as lucky as I had been half my life ago? I got a glimpse into the bravery, that some people I've met along the journey I started when I was diagnosed age 9, have. I can only understand in part the courage some people have to live a life full of pain, fatigue and danger, of having a seizure at the wrong time or in the wrong place. For me, it puts into perspective any struggle I've had in this past year. It might have been the year when after a 3 year absence, my seizures were like buses and 3 came along in the same year, but so what? I was ill for about 5 days out of 365, those other 360 I was well, able to work, able to ride my bike. Whatever disappointments I've had on the bike this year, tomorrow is another day and 2015 is another year. So what of 2015? Well firstly I will start it in a different city than 2014. I've moved back home to Scotland and back to the city I was born in, the city of the 2014 Commonwealth Games, Glasgow. Despite the last few weeks being difficult and turbulent, there's always a highlight at the end of the year that lifts my spirits. The BBC Sports Personality of the Year. In amongst the montages of the nominees, who show the most incredible skill, power, strength, speed, accuracy, commitment, there was a recurring question of: "What is Sport?" It means different things to different people, but it means more than I can describe, to me, as I've talked about many times before in the blog. As for my own sport, I've had the heartache of leaving the club, who will always be my team, whenever I talk about London and Hockey. The London Edwardians. Starting the season as the first XI goalkeeper again, in the safest place I could be on earth, on a hockey pitch. I'm proud that I left England playing Surrey Premiership hockey and with my team at the top of the league. I just hope and pray, that after all the hard work the girls put in each week, that they, and the rest of the club can finish in top spot in their respective league. Coming home I can't help but try to refocus on my cycling however. Maybe I'm not quite ready to join a new hockey club just yet, I still feel like a London Edwardian. So I have my target to get the funding for the Race Across America secured for the team. But there's also another ambition I want to fulfil next year too. The UMCA Larry Schwartz Award, as part of their Year Rounder Competition. Over 100 miles in a single ride, without drafting, each month, for the entire year. Of course I want to do it primarily, to raise funds for Epilepsy Action and feel it's significant enough a challenge that it would be worth a donation, but I hope it makes even a little statement about the condition too. After that, I'll continue to get the club launched properly and hope that 2015, brings better fortunes financially, that will allow Epilepsy Forward Cycling, to start to compete on the national stage. I don't normally delve into politics with a large P on my blog too often, but I think it's hugely important to explain why a Glasgow born Brit, has benefited quite so much from the wonderful union of the United Kingdom. I wondered what would happen to me if I was born into a Glasgow that was the largest city in an Independent Scotland? The scary conclusion I've come to, isn't something I would ever wish for my own children, if it had been the case. I wondered if I would have been able to have the help of the British Epilepsy Association, Epilepsy Action? I wondered if I would have been able to move and make an impact in the cycling community in London with such ease, if I was a foreigner? What scares me most however, is the idea that the NHS wouldn't have been as strong in Scotland, as it was in a United Kingdom and thus the idea that the utterly life changing surgery I underwent, wouldn't have been able to happen at all? No matter what the situation, I have never known fear like I used to experience numerous times a day, from my petit-mal auras I went through as a child. Before or since. I can't comprehend a world through my own eyes, where I hadn't lived the second part of it almost totally epilepsy free. But what's more, without the Olympics, there's no way I could have had the opportunity to gain publicity, for the cause of raising awareness of my condition. What happened to me on the 26th of July 2012, has so far been the single most amazing thing to occur in my life because of how I view sport. I've talked about it before in the blog, but for some reason, it felt only right that I should bring my torch out with me to the 'Let's stay together' rally in Trafalgar Sq, London. Because without being British I believe I would be in a very different, incomprehensible situation. It scares me so much to think about what would have happened if I had not been in the care of the NHS, that I don't even feel I could say it out loud. I don't believe that any young girl born after next week, who could develop epilepsy like I did when I was 4, should ever not be able to have the truly, utterly, life-changing neurosurgery, that I had. Because the situation where that wouldn't be the case, is unthinkable and having to go through a decade of the condition in the extreme states in put me in, was enough. But there is another question of identity for me above and beyond epileptic, or a cyclist. If Scotland becomes independent, what nationality am I? Despite being born, brought up and educated in Scotland, before serving the city of Glasgow as a Police Constable, I can't vote on Scotland's question of Independence. So it confuses me about how I'm viewed and it makes me upset because of this. I have a British Passport, but in London I'd be viewed as being Scottish, even more so if Scotland were independent. Knowing I can't vote in the referendum means I'm being made to feel as if I'm not Scottish enough though? So who am I? Am I just epileptic? I don't want to be totally defined by my condition, but at the same time, it's the only identity I'm certain of in a world where Scotland and the UK are divorced. It's written on my ID band, so it must be who I am when I no longer feel Scottish enough to have a say, or British enough when I speak to people with my Scottish accent in London. I'm proud to be born in Scotland, to be Glaswegian, but have the comfort to know, that also made me British too. This country has brought out the best in me, be it living in Glasgow, Edinburgh, Durham or London, I feel I'm a better person for being born into a United Kingdom. There are a million reasons I could give to vote to stay part of the UK and say No Thanks to Scottish Independence. But I'm just an example of why I'm lucky to be born British. Not Scottish, not Northern Irish, not English, not Welsh, not Manx, not a Channel Islander, but British. So I'm trying everything I can to make sure if there's a young girl born in Scotland next week called Katie and if she were to develop epilepsy like I did, that she have the same amazing opportunities and help, support and treatment, I have had. 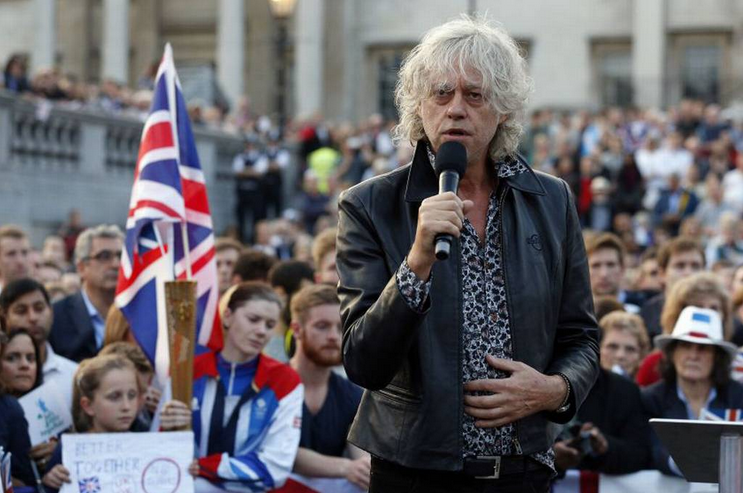 So that's why I went along to Trafalgar Square this evening with my torch clad in the Union Jack flag of my Team GB jacket, wearing my Scottish cycling jersey underneath, to join so many other Brits that feel the same way. What's more, I had some help holding my torch from a young girl in a Scottish football top called Eve. She had an English accent and mother, yet a Scottish father. I was the girl in a GB top, with a Scottish accent and mother, yet an English father. ...Some might even say we were 'Better Together'! I don't think I've ever spent £45 so wisely, but at the same time, paying a graphic designer to clean up the Epilepsy Forward Cycling logo, feels like a massive step. It's a wonder I didn't do it before, but it will mean that the O2 Creation kit that will belong to the club, will now be able to be made. I believe in this team, club and the project as a whole, more than I can say and at the moment, nothing is giving me more heart during my training rides, than seeing the club come together. I genuinely think that epilepsy has a far better future than it does now and while I don't know how much of a part the club will have to play in that, I do know that people who are proud to wear purple, or the Epilepsy Action logo, will finally have a cycling team to call home. For the last 6 years I've cycled with other teams, my university, my RAAM team, but I've never felt as at home riding as I did cycling for Epilepsy Action last year. In a huge way, I'll still be riding for Epilepsy Action, with the new Epilepsy Forward team - any profit from the club will go to the charity, with the jerseys able to be bought without people wanting to become a full member and the money generated going straight to the charity. But there's something about riding in full high quality kit, that makes you feel better about your abilities, feel better about your cause. When the club launches at the end of July, we want to attract strong riders to it, so that the name Epilepsy Forward will be seen in British Cycling's results page. I want us to be able to build a club that can win races and be visible across the UK. It's an ambitious target, but I always think if you don't put your faith in something and go into it half hearted then it will never work. So I want to be able to have everyone ride in high quality kit, because I know that in cycling, little gains matter. If the little gains can make a difference then, it's my hope, that a strong brand which is so much about epilepsy as a condition, will make a positive impact. Being one of Epilepsy Forward's riders however, also requires another type of investment, in time and sweat, making sure the hours spent out on the bike, will make for a good ride from me personally. It's fine to talk the talk, but riding 12 hours, like I will tomorrow, means commitment and hard cycling. The only way to prepare for my challenge I have set myself for this summer, including 200 mile 12HR rides and a 400 mile 24HR ride, is to put those kind of miles in every weekend. While so far while my training in on schedule, I'm not there yet. At the end of the day, I just need to keep riding. While a bad workman blames his tools, I know I'll have the best tools possible. I want to make sure that I'm deserving of wearing the purple kit and Epilepsy Action logo on my back. It's been hugely enjoyable to write the blog for the 7 days during epilepsy week. Maybe this time next year we could be further forward with researching a cure or tackling the stigma of epilepsy. The difficulty with epilepsy though, is it's hard to be able to help those with the most serious forms of epilepsy while at the same time tackling the stigma. The paradox to epilepsy is that by emphasising it's seriousness and finding the funding for care and cure, you are making it more difficult to tackle the stigma. Likewise, by tackling the stigma, people may think the condition isn't serious enough to warrant raising funds for a cure for the most serious types of the condition. Where I feel I can best help is by showing that people with epilepsy can be as physically able as anyone else, because I fall into the category of individuals with controlled epilepsy. So as long as I'm disciplined in taking my medication, I should be seizure free the rest of my life in theory. But at the same time, there is far too many people dying because of their epilepsy and under no circumstances would I ever want to forget that. People should deserve to ask for help to stop epilepsy deaths, but at the same time, for those who it's relevant for, they should be able to ask for equal treatment to anyone who has a full bill of health too. Because to a large extent, for those individuals, only in name are they epileptic. I made a change recently to the shirts that Epilepsy Forward CC would wear. There are people across the world who stand in silence for so many causes, but I've never seen it happen in memory of those who have died from epilepsy. The chances are that far too many will have died this week, so we want to remember and tackle stigma at the same time. The Epilepsy Forward Cycling shirts are a paradox too. They bear the purple of awareness and their purpose is to be as high end as possible to break world records, under the banner of an epilepsy focused sports team, that pushes any healthy individuals limits to the brink. But at the same time they'll have a black band round the right arm of the shirt in remembrance of all the tragic, mostly preventable deaths that have occurred due to the condition. The variations within epilepsy are huge. They range from a large number of individuals who are Olympic standard athletes, musicians, lawyers, actors, writers, to the horrendous types of epilepsy that require round the clock care. The chances are that if someone is applying for a job, their epilepsy is well under control, but because many people don't know to ask, they don't realise that epilepsy can be totally controlled. They don't know to ask, how a person who may join their company is affected by their epilepsy. At the end of the day, it's not in the individual's interest to lie about how they are affected by their epilepsy, it could mean that they are put in danger. They also don't want to loose a job, because they have been dishonest about their condition, as it will make it incredibly difficult to find another one. I hope the posts have highlighted the struggle on more than one front, that the charities who work for a better life for people with epilepsy face. You probably know someone with epilepsy reasonably close to you. The stats show that 20% of you reading this will have a seizure at some point in your life. Tomorrow, about 87 people will be newly diagnosed with epilepsy in the UK alone, joining the 65 Million people worldwide with the condition. Choosing an epilepsy charity to raise money for, will make a difference to more people than you could probably know. Texting FUTURE87 to 70500 in the UK, will donate £3 to Epilepsy Action and each country's epilepsy charities will likely do something similar to boost what they can do to help stigma, care and cure. At the end of the day, any help you can give, however small could make such a difference. It can be difficult to describe a seizure, sometimes impossible to describe it up to a certain point... How do you describe a kind of fear you can't understand yourself in your own head? How would you describe de-ja-vu that doesn't make any sense and that even seconds after you've experienced it disappears from your memory anyway? This is a glimpse into the epilepsy I know. I hated it and now that it's under control if feels like being released from prison. It might not be as safe for everyday life, but there's a huge relief from not experiencing the small conscious seizures, called petit mals. It's hard to try and get across that violent seizures aren't sore, they're not painful and not scary for the person actually having them. But I have a theory and a hope that in explaining what I am in this post, could maybe help the stigma to those that read it. I can't stop the fact that epileptic seizures that are clonic-tonic grand mal seizures look odd, potentially scary, but I can explain that they're just a part of everyday life. It's incredibly difficult to put your finger on exactly what about epilepsy causes it's stigma, but I believe that feeling like you're watching a person in pain has something to do with it. If a had a seizure tomorrow, while it would be unfortunate, it wouldn't affect my life adversely. Furthermore, if like previously, they weren't controlled, it would just be another normal part of my life. You see, the one mercy that epilepsy allows its' sufferers is that, you can't feel anything during generalised seizures. It doesn't hurt to have one and post having them, the tiredness that they cause it almost anaesthetic like. The initial pain has gone most of the time, after regaining full consciousness and awareness. If I had them in bed, they would never effect my life except for maybe a few hours off work if it was money to friday, to sleep off the tiredness. It wouldn't effect my physical capability outside of those boundaries and quite frankly, if I could find an employer that would be accommodating, if like many people with the condition, I had seizures occasionally, then, say I worked later to make up the hours, I'd be as physically and mentally able as any other employee, who had a 100% bill of health. You see as someone with epilepsy, it's hard to find the route of how to tackle the stigma, but in a way, I hope the knowledge that actually, nobody is in pain themselves during a violent seizure, might go a little way to de-mistefying the condition and the black cloud that surrounds it. I find it amazing how the simplest things give me inspiration for writing these blogs. Tonight it was my flatmate and I, just talking about starting to listen to music again after we felt rubbish for a particular reason. I remember when I hit rock bottom, during the time I suffered from severe depression due to taking an old medication. It made me feel so bad, I couldn't even find music to fit my mood ...Past even feeling up to riding my bike, I didn't even have the energy to feel sorry for myself for not feeling up to riding it, or even the soundtrack to go along with my misery. I don't remember a lot about the few weeks before starting having nausea as well, but after that I just took myself off the medication, but only because it didn't control my epilepsy either. I wouldn't recommend it without advice from your doctor. I walked into class, it was Media in Sport or something. The sun was shining and I pulled my ipod out of my pocket. I went to an old song, that has almost always been my 'happy' song since I was at school, Space Cowboy - 'I Would Die 4 U'. The people I walked past in the street must have thought I was a nutter. I was smiling away to myself for no reason whatsoever. I was just happy again. It's hard to explain what's it's like when you come out the other side from dealing with depression, it's like waking up for the first time all over again. Some people have described it to me as shedding a skin, like you're fresh again and I can see what they mean. Others have described it as being like a caterpillar that's been in hibernation and has turned into a butterfly. I especially liked that description, it seemed a nice one, because the thing that came out of the situation with taking my Keppra medication, was that I learned about myself. So in a way I felt like I grew up a little more. I don't know if it's the way my brain is wired... well I suppose it must be really, but I love music and it really changes my mood a lot of the time. Getting rid of the Keppra and moving to a different medication gave me a new lease of life and while I don't seem to have strong memories of a lot of amazing things that have happened to me during my life, I do have a very strong one of riding my bike for the first time again after coming off my Keppra, ipod in my ears, listening to 'Halo' by Texas, flying down the hill to my lecture on my bike and feeling like I could take on the world. For me it was my bike and Sharleen Spiteri singing, "she's so pretty, her hair is a mess...", which is something my mum would say to me! I got a strong powerful sense of happiness from it. ...I don't think I could have got a degree. When Cassidy Megan started Purple Day a number of years ago now, it wasn't a random colour chosen to signify the condition because nobody else had taken it, there was a message behind it. Lavender grows in isolation normally and depressingly, many young people with epilepsy have to grow up in isolation too. Not because they don't have friends, but because it's almost impossible for people without epilepsy, to come close to understanding what the condition is like to experience. It's hard to explain that you've got a short attention span, because your brain is so constantly disrupted all the time, or because your epilepsy affects a part of your brain that it uses for learning skills. It's almost impossible to explain certain types of epilepsy, like my own temporal lobe epilepsy, where the sense of non specific fear is so strong and potent, that you just can compare it to anything, even though you're awake, conscious and can still, with limited capability, talk as normal. While the statistics show that it's not the case the other way around, there are also a large number of people with learning disabilities, that also have epilepsy. I can't even imagine how they must feel, not being able to communicate in the way they would like, amongst their peers, never mind having the epilepsy to deal with on top of that. Sometimes you just have to concede that you're alone in your own head with your thoughts and you can't explain them. In the 21st century, social media has developed as a such a fast rate, it's hard to keep up. And it has major benefits for finding people who also have epilepsy and being able to talk to them. Facebook is a brilliant example, where epilepsy support groups are open and full of conversation about experiences of epilepsy, the medication side effects and generally just confirmation for people, that actually, what they are going through is totally normal and is also happening to other people with epilepsy too. Young Epilepsy, have for years now run a brilliant school for kids with severe epilepsy, meaning that they can be amongst their peers and get the best support possible, that doesn't patronise, but just helps in their educational and social development. Epilepsy Action, who are the biggest member led epilepsy organisation in the country, have branches across large parts of the UK, but also run a number of events and even tea and coffee groups. I guess when peer pressure demands that you drink alcohol after a certain age, it's great knowing no one will judge you for having a cuppa instead of a beer. Epilepsy Society, run the specialist epilepsy hospital in Chalfont St Peter, where it's impossible not to find people going through exactly the same experience as you I think. It's also where I met two of my best friends, Georgia and Susie while I was being re-tested to get my specific epilepsy diagnosis. I guess your friends are going to be people you can relate to most and that are your peers. I should expect that finding people who are going to know exactly what you're going through yourself, makes for a lot of less isolated life. The thing with experimenting with medications for certain types of epilepsy, is it can take years to find a medication that works, if you have long gaps between seizures. But even frequent epilepsy can be difficult to get an exact diagnosis for too. There's a number of strategies to use when helping your Neurologist figure out the best treatment for your epilepsy, but even just finding out what kind of epilepsy you have, can make a huge difference to helping you feel less isolated within your own community. I remember speaking to a young woman, Rachel, at Chalfont St Peter, the specialist epilepsy centre and I talked to her about our Temporal Lobe Epilepsy Petit-mal seizures. It was as if a light had just gone on in our heads and it was so liberating to find someone who understood something, which can often feel impossible to explain. What people don't really understand, is there is a host of different kinds of epilepsy people could have. It's like the different kinds of cancer there are, except it's specific to the brain, so what you actually do during a seizure, could do so much to help your Neurologist understand if your epilepsy is starting in the left or right side of your brain, if it's impacted by lights, if it is centred round the area where you process emotions... there are so many things your doctor can take from seeing one of your seizures. It's why I always ask my friends, (if they can get over the fear of dealing with a seizure) to try and film it on their phone. I understand that's not always possible, so the next best thing I can do, is ask them to describe it for me, but in particular, for myself, to keep a track of exactly when I've taken (or on rare occasions) missed my medication. What time of day I had my seizure, what day of the month, did I have exam stress, for girls, was it just before starting their period, did I miss any meals? All of this info can hugely help work out why you're having seizures and keeping a track of it can greatly help your doctor find the best medication for you. The other thing I found was not to be afraid to be assertive about recognising symptoms, from places you can trust information you're getting about your epilepsy. If you're recognising symptoms, make sure you tell your doctor about it - it can all speed up the process of getting to the right medication quicker. The biggest thing for me though, is actually going through full testing, like EEGs or ECGs despite how painful it might be to attach the electrodes to your head's surface, it's so valuable in detecting where your epilepsy is coming from. MRI scanning too, has completely changed Neurology more than most Neuroscientists could imagine I expect. It's a fantastic tool for using to detect things like scarring on the brain, so despite my dislike of enclosed spaces, it was so worth the time spent in the scanner. There are so many aids to finding the best possible treatment for whatever type of epilepsy you have diagnosed. Places like, Epilepsy Action, Epilepsy Society and Young Epilepsy, will never not provide you with information and tools like seizure diaries, to help you get to the bottom of your condition. At the end of the day, when it comes to drilling down into a specific epilepsy diagnoses, you can never give your doctor too much information. One of the most frustrating things about my epilepsy for me, is the stigma surrounding the condition. I've had to endure it despite having controlled epilepsy. But just the mention of the condition and it makes many people run a mile. I've heard people say that in certain parts of the world, people still think that someone is possessed and that they wouldn't touch them during a seizure because they thought they might catch epilepsy themselves. It's insane. The fact is that because people who have the condition don't like the reaction they get when they tell someone they have it, they don't and that's when it becomes dangerous. After having a seizure I've asked many people about what happened during it, so I could explain the seizure to my Neurologist. Usually the first thing they say is, "well it was really scary!" Even people I've explained how to deal with my seizures too are scared of them. But then I think, well it's not happening to you, but I feel compelled to apologise for scaring them anyway. When I pushed deeper into why they found it scary, I asked did they think I would hit them or anything, during the seziure, that they might get injured helping? But that wasn't it either. What it actually was, was that it was just scary to watch. That watching someone injure themselves was unpleasant. I suppose that's why people feel compelled to cause injury to someone having a seizure and hold them down. I suppose they want to make it stop. Ironic really isn't it? The attitude of watching someone have a seizure and being scared though, I find selfish. It's not something I'm proud of for feeling, but I don't understand why people with epilepsy should ever apologise for something, they can't control, or didn't cause. They didn't decide to have epilepsy so they could have a party trick to scare their friends. Given when I've seen Grand-mal Tonic-Clonic seizures myself and wasn't scared by them, the only conclusion I can come to, is that it's a question of knowledge. I'm not scared by watching someone have one because I know a) what to do and b) what they feel like from the point of view of the sufferer. So I know that all you can do is time the seizure and make sure the sufferer has something soft under them, so they're not in pain when they come round from the seizure. I know they can't be in any pain because they can't feel anything during the seizure. I know that they won't suddenly jump up and attack me and I know that as long as I make sure the seizure isn't longer than 5 minutes, they'll just come round, have some sleep and get on with their daily life. For me, that's why they're not scary at all. So when a young guy I helped on the London Underground a couple of years ago starting apologising about making me scared, I simply said: "Why would I be scared? I'm not the one having the seizure." When I asked if it was scary for him, he just said no, I never know what's going on, I just wake up and want to go to sleep. I suppose people are scared of what they don't know, so as a result, if they don't understand epilepsy, they're scared of it. Coming from someone who does know epilepsy, after 25 years of having it, I can tell you, as long as the seizure doesn't last more than 5 minutes, there's nothing to be scared of. Firstly, I should tell you that I'm writing a blog a day for the whole of UK National Epilepsy Week, which by the way... Starts today! I woke up this morning, to my music which was playing through the night as it usually does and what will I'm told be one of the sunniest days of the year. It's a good start to National Epilepsy Week in my view and to be quite honest, the sun always makes me feel bright myself and hopeful. The theme of National Epilepsy Week this year is about diagnoses. While I know the stats and how lucky I was to have had my surgery, I still believe that after a diagnoses, people with the condition should never give up hope of having their seizures controlled or cured altogether. I think one of the lowest points of my life, was when I had the breakthrough seizure while working in Glasgow as a Police Constable. I had everything planned out, I was almost 19, I had a 30 year career and a great pension to look forward to, financial security, a car and independence and for a teenager, a huge salary and clump of money from the pay I wasn't really using while at the fully catered and residential Scottish Police College. But life has a pretty good way of throwing a spanner in the works of your plans. One night in Glasgow out with friends, I had the breakthrough seizure. It didn't take a lot to be re-diagnosed with epilepsy again, so I guess I've had 2 diagnoses. But here's the thing, they weren't life sentences. What my epilepsy was like before the age of 14, was well, pretty horrific I won't lie. But I went to a place where I was given hope, The Sick Children's Hospital in Edinburgh. Having my Neurosurgery, which I technically had twice... one work up operation, where electrode rods were implanted in my brain for a week or two so that the doctors could very specifically isolate where my epilepsy was coming from, then the second to remove the scar that was causing it. No matter how many side effects I experienced from medications, I never really felt like my epilepsy would be as even as close to as frequent and serious as it was, since it was diagnosed when I was 9. I never understood why really, maybe blind hope of a kid who had a childish optimism, or maybe it was an odd intuition, but whenever I was in Ward 7, I always felt like I was going to be cured. The second time I was diagnosed, after I got over the disappointment of loosing my career, I began to get focused on controlling what was left of my epilepsy with medication. The funny thing about what happened, was that I still remember standing to attention during my passing out parade at the Police College and thinking, hmm... it's a shame I never got to go to university. As it turned out, I went to one of the best universities in the country, where after getting such enjoyment from playing hockey while in the police, I went on to study Sport at Durham. Although I had some major hiccups along the way, the number of medications that were around for me to try were huge, so I never really lost my optimism about controlling my few grand-mal tonic-clonic seizures. Eventually I went to the National Hospital for Neurology and Neurosurgery at Queens Square in London. It was a revelation and they sent me to the NSE's epilepsy hospital in Chalfont St. Peter. Not only did they diagnose my epilepsy properly, understand it better and put me on the medications, which so far, apart from the occasions I have forgotten to take them morning and night, (by the way, I'm not a good case study here... Take your medication!!) have meant I haven't had any seizures. I mean how great is that? I owe a lot, to a really large number of people who looked after me. But the amazing thing is, the technology and understanding of Neurology and epilepsy in particular, is always moving on and getting better. Last year they found what looks like the beginnings of a gene therapy for curing epilepsy, calm down genes in the brain... Brilliant! The fact we have some amazing hospitals in this country, although I know we're not perfect, means that we should never give up hope after a diagnoses of epilepsy. The Sick Kids' in Edinburgh changed my life. Even though I didn't end up as a career Constable, I got to do some truly amazing things, go to university, cycle across America, coach young kids sport... carry the Olympic Flame! I wouldn't have gotten to do any of it without the hospital and all the staff in Ward 7, so once the building works are finished there, I'll be making a special delivery. I'm so proud of owning an Olympic torch, it's one of the most incredible objects around I think. But it's currently residing in where I consider, is not it's rightful home, in my flat. I don't think it belongs here, because of what a small Neurology hospital ward did for me. I want the kids of Ward 7 to know that they shouldn't give up hope either, so I've agreed with the Sick Kids Friends Foundation, to hold it in trust in Ward 7, until my kids (if I have any!) decide they would like it. I can't really do much to repay the impact Ward 7 had on my life, but I hope this goes a little way to paying some of it off a little and letting the kids there know that there's always hope as long as there's the science and the care around to feed it. I'm very lucky indeed that I don't need to hope anymore. After developing it two and a half decades ago, I'm just living my life seizure free. Someone said to me recently that I shouldn't label myself because of a medical condition. It got me thinking about how they saw me, but in a bigger way, how they saw themselves? If they don't have the experience to know what you know, then maybe it's worth blocking them out. The phrase 'self diagnoses' seemed problematic to them, but then, maybe that's just because it didn't work for them? We're all different, so look to yourself before you look to others for advice, because it's likely you know yourself better than you think. The conversation also made me think back to a time, when how I was defined, how I was mis-diagnosed, changed the course of my university career. One of the worst Neurology Consultants I ever came across, didn't want me to label myself either. I thought I might have Catamenial Epilepsy and after looking at a huge range of researched information on it, asked if I could be put on a drug Clobazam. The reply I received from a man who did not have epilepsy was this: "No. It hasn't worked for me in the past." I couldn't get the medication I thought I needed, but I felt angry that my idea, my knowledge of my own symptoms, was dismissed so readily out of hand. The drug I was put on instead made me effectively loose a year and a half of my life. Keppra. I think that we should all be given the power to label ourselves if we want to. If it doesn't impact on someone else's life, why should we not be allowed to? My friend Leigh heard a young boy who wanted to become a doctor talk about his ambition to his mother in public. His motivation was that he wanted to cure a cancer that had affected one of his family members, his Nanna. Yet, instead of support, his mother told him, "Don't be silly, you'll have to get a real job." If every child was persuaded away from wanting to label themselves as a doctor, we'd all be ill. As it turns out, in this financial climate, it's actually a brilliantly secure job. It's not just a proper job, it's a career for life. I believe that if we're empowered to give ourselves our own labels, then that's when we truly allow ourselves to flourish. Embracing the label of epilepsy, means that I'm safer as a result. It means I wear my medical ID every day. I hope the fact I don't want to shy away from the label, means that other people with epilepsy will be treated with more dignity in the future. That they won't suffer the same experience I have and that my friends have because I also label myself as an Ultra-marathon cyclist. Maybe the fact that someone who doesn't like my epilepsy label, couldn't conceive of taking part in the cycling races I do, might make them think twice about what they think epilepsy is. Understanding yourself, how you work and blocking out the external factors in your life can be beneficial. Sometimes we need the external factors, the family support, or medical support to help us. A guiding hand educating us. But ultimately if you want to shoot for something, go for it and don't let others tell you you're not able to achieve it. If you work hard enough for something you'll achieve it. For me, I wanted to work hard to find a medication that would control, the tiny few seizures that I did suffer, after surgery, without the horrific side effects. I kept working for it, trying another Consultant who spent more time with me, tested my epilepsy, to find the medication I needed. I'm now on 2 medications and have been for about 5 years now. Oxcarbazepine and Clobazam. They're enough to control my seizures and I don't suffer any side effects as a result of taking them. So as it turned out, what 'didn't work' for someone who didn't know me, or seem to want to hear what I had to say, worked for me. I've had an up and down start to the year so far, some frustrations and battles, some disappointments and some new challenges. I've had to cancel RAAM (again) for another year due to funds, which has been extremely frustrating, but then I think everyone is finding that charity sponsorship is becoming more and more difficult to obtain in the current financial climate. After getting to the bottom of the issues which surrounded a rather blocked attempt to use the indoor Velodrome in Stratford, London, where the 2012 Olympic Track Cycling was held, there was a bit of a breakthrough, but still a bit of a fight I can foresee coming. It seems 24HR licences for venues are rather difficult things to acquire, even for world record attempts! So it seems that instead I am fast becoming the symbol of all things Scottish, in music terms at least and that rather famous song about 500 miles, sung by a set of twins from Edinburgh, could well be my summer anthem. I always wanted to take part in the Prudential Ride 100 again this August. Call it unfinished business after crashing, but I feel like I could have knocked 45 minutes off my time if I hadn't crashed and because of that felt I'd let the charity down. However, I've always thought you should earn your sponsorship money people give you. Instead of that extra pint, extra bit of shopping, bottle of wine, whatever, the fact is they're giving it to a charity you feel really passionate about instead of spending it on themselves. So I suppose for someone looking to break world records and having finished Team RAAM, a 100 mile sportive, would be like a charity 10K to an experienced Marathon runner. So in order to earn every penny, I wanted to push my limits and so I could really crack the 6 hour mark when it came to riding the 100 in London and Surrey. I suppose the question is, how would I do that? Well my idea was to ride 1000 miles in 60 hours, or 2 and a half days. The form it would take works nicely (in theory), so that I would tip the 1000 mile mark during the last ride in London which I was so eager to complete again as part of Epilepsy Action's team of riders, or 'heros' as they call them. The other rides would comprise another 100 TT - the British 100TT Championships, 2 x 12HR TTs, one of which would be in North Yorkshire, which to be honest, is one or the rides I'm most nervous about because of the likelihood of hills, then finally the British 24HR TT Championships. Again arguably the toughest ride of the 5 given it's the longest distance, but with a lot of training under my belt come the end of June, I feel like I should be in a great place to crack 400 miles. So 1 400 mile ride, 2 200 mile rides and 2 100 mile rides feels like I'd be properly pushing myself for the charity and because it's not just one big effort, it feels like a genuine challenge, over 2 months. To put it into perspective, it's a third of RAAM Solo, further than the distance of the UK end to end and just under half the distance of this year's Tour de France, but in a quarter of the stages rides and with no drafting. I'll have 4 months of training in total, meaning I'm likely to ride about 4000 miles in total including training, but to be honest, I feel better, healthier, am sleeping better, just after starting my training cycle of the last 2 weeks. So what else has happened? Well I've gotten a year older, which apparently improves your endurance! So I guess that's a good thing. I've also thought about completely cutting back on drinking alcohol at all, only reserving a glass of something for special occasions, which has also made me feel better generally. The major thing that has happened epilepsy wise though, is having a seizure a couple of months ago. It's reminded me of the importance of wearing my medical ID, but also what amazing people I live with, as our Master's student in the house, Anna seemed very calm and totally dealt with the situation, with the help of my other flatmate Alex and they were both awesome. I guess I always feel a bit guilty, that they have had to deal with the stress of seeing me have a seizure, but I'm definitely in their debt. It also reminds me of the importance of the charity. It might have only been the second seizure I've had in about 4 years, but without their help, knowledge and the help of the Sick Kids Hospital in Edinburgh, I would be having that many in a 3 weeks. I guess it's easier not to think about your epilepsy when it feels completely under control, forget about how horrible it can be ...but the fact is, there is still approximately 600,000 people in the UK alone and about 68 Million people worldwide who have epilepsy, many of whom will be suffering with it terribly. At least Epilepsy Action can provide them with information, wherever we are in the world. Although it's unpleasant to have the seizures, the one bright spot that comes from them, is the reminder of how important the charity's work is and little reminder of the motivation that helps me get through so much training and when the ultra-distance rides get really painful, of why I'm doing them. I know £5000 is a very ambitious target, but I know how much it could do, so it would be well worth giving it a shot and all the training I'd put in to the challenge. It would be amazing if you could stick the link in your top bar and donate anything you can. "But I would ride five hundred miles and I would ride five hundred more, just to be that girl who dropped five thousand pounds at Epilepsy Action's door....."
"Dun liddle un-liddle un-liddle uh da da....!!"